Hailing from Spain, the intrepid spirit, jaunty hat and five o'clock shadow of Tad Jones results in a less than subtle parody of Harrison Ford's iconic adventurer. Having scored a surprise hit domestically with 2012's Tad: The Explorer, Enrique Gato's sequel (co-directed with David Alonso) aims to establish the brand internationally; a mummified character who could have stepped directly from the realm of the undead featured in Pixar's Coco might entice audiences to check Tad out. 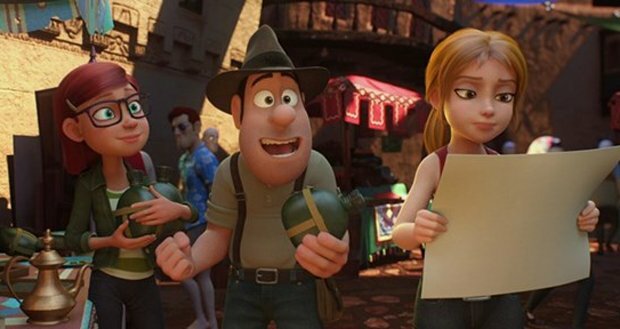 Five years after the first film's events, Tad (voiced by Trevor White in the English-language version) travels to Las Vegas with his mummy friend in tow, hoping to see his potential girlfriend Sara (Alex Kelly) unveil her research into King Midas. Sara is kidnapped, but she leaves behind a notebook clue revealing three locations where Midas's treasure is buried. Tad, his dog Jeff, a silent parrot called Belzoni and Tad's undead pal all head to Spain to rescue Sara and thwart an evil millionaire's plans for the hidden gold. Alonso and Gato have fashioned a brisk but painfully derivative cartoon pitched at those of primary school age; the animation, music and jokes all barely passable rather than notable. As well as Indiana Jones, Mario Bava's 1968 cult classic Danger: Diabolik seems to be a key reference point: from the villain's trapdoor in the floor of his plane, to the characters becoming encased in molten gold. Fortunately the Tad franchise has the sense to steal from the best, even if such copy-cat strategies deprive the hero of any unique character of his own. This is an animation designed to be a brief stepping-stone for children on their way to bigger, better things. At least the unnamed mummy raises a few laughs and groans alike with his vaudevillian 'give me a hand' routine. General release from Fri 9 Feb.
Tad (White in the English dub) travels to Las Vegas with his mummified friend in two, hoping to see his girlfriend (Kelly), but she’s kidnapped. Painfully derivative Spanish cartoon pitched at primary schoolers, barely passable rather than notable, but at least it steals from the best.